I received my master’s degree at Duquesne University in Pittsburgh. I’m attending Rocky Mountain University of Health Professions for my Doctorate degree. How did you discover OT? 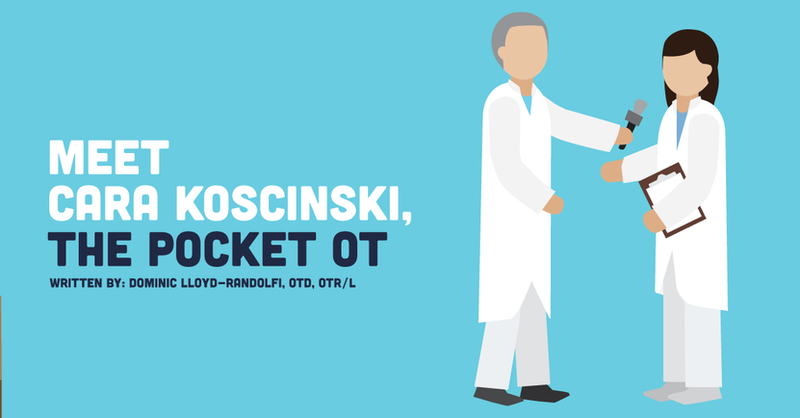 Have you always wanted to be an OT? As a Junior in high school, I volunteered at a hospital. One day I helped at the occupational therapy clinic, I immediately knew that’s where I wanted to be. I was accepted into an entry-level master’s degree program and never looked back! Have you always worked in pediatric OT? I began my career in adult rehabilitation and then in a hand therapy clinic. When my children were born, I knew they weren’t typically developing. Eventually, they were both diagnosed with autism and I spent a great deal of time with them in therapy of all types. I took the good and left the bad. It was like a Level 3 extra fieldwork experience! I knew pediatrics was for me. Fast forward 20 years later and I’m traveling to speak about the benefits of OT with anyone who will listen. Tell us about your journey to running a website and hosting CEUs? I’m unique in the fact that I am an OT AND mother to two boys with special needs. I truly empathize with what families are going through, plus I have the knowledge and training of an OT. I was giving the same advice to my families and staff over and over. I thought I’d just put it all into a book. That’s how my first book, The Parent’s Guide to Occupational Therapy for Autism & Special Needs, was born. Therapists across the world were reaching out for more advice and requesting me to teach them what I knew. I’m the type of person who cannot sleep and must do more and more – especially when it comes to helping others. The whole website grew and grew, which I did not expect! When did you know you wanted to switch jobs? Was it sudden or slowly develop? My story is so different because the birth of my children with special needs changed my career. I knew I needed to learn as much as I could to give my boys the best chance at a functional life. There’s a certain passion you have when it comes to your own children. I attended every conference, course, seminar that I could find for pediatric OTs. I learned SO much and then found out that that combined with living with my boys and homeschooling them, I could truly help other therapists and parents to do their best work. I love it! After my presentations I receive feedback. Quite often attendees report that they love hearing my personal stories to convey ideas. That makes it all worth it! What kind of training/support did you have for everything on the technology side? I had to take classes for that too. When I went to university, we were just beginning to use computers. I took a typewriter to school as a Freshman! I was one of the first therapy bloggers, having started in 2005. I hired someone to teach me and he was wonderful to learn from. Fast forward 20+ years and my sons are the ones who show me what to do! How did you get your name out there/promote yourself? I wanted my business name to represent my sons, so my company was first called Route2Greatness. The boys really love drawing road maps and studying US topography. The name didn’t show what I did, though and through trial and error, I found out that I needed to re-brand. The name, The Pocket Occupational Therapist came from my husband. He and I were joking one day, and he said, “You’re so easily accessible to so many people, it’s like you’re giving them a pocket guide book.” BAM! The Pocket OT was born. How is it now? Are you still able to afford your same lifestyle? It keeps me quite busy. I employ two wonderful staff members and my family helps too. It took me a long time to make any profit. I love investing earnings back into courses, handout creation, travel, and programs that help my website to run better. I am going back to school, so I’ve scheduled many in-person seminars to help me pay my tuition. My entire life is about special needs. I work it . . . I live it. My son is going to college this fall. As a family, we have the same struggles as anyone else and then the additional stress of raising two sons with special needs. My younger son has a feeding tube and will most likely be living with us for a long time. It all takes a toll on my health. However, I would not change my life at all. I feel that I was given this life because my passion for OT and for helping others fits with my love for my own children. Helping each other and being a woman business owner is empowering for me. There really are no cons! Well, if you ask my husband he will tell you I work too much: 7 days a week and at least 10 hours daily. They will have to drag me out of the work force into retirement someday . . . I won’t go willingly. What advice do you have for new grad OTs considering this type of career? People going into OT tend to be caring and creative. Adapting activities for clients of all ages requires flexibility and the ability to think outside of the box. Continual learning after college makes therapists well-rounded and this is always a wonderful trait. Parents are looking for an energetic and empathetic therapist for their child or family member. It takes someone who is willing to search for answers and give each child a chance to live their best possible life. In April, I started OT2OT as a part of The Pocket Occupational Therapy website. It will be a store featuring materials created by OTs for OTs. We have gathered some awesome resources therapists are looking for. Since I’m always asked to mentor others, there will be affordable mentoring packages and coursework designed to help therapists develop clinical reasoning and learn skills that are evidence-based and functional. There will be a new Pediatric OT Primer course and a new series on Trauma-Informed care for OTs also! Go to PocketOT for more details and to sign up for our newsletter for freebies and blog posts giving useful information. Mentorship for the New Grad Physical Therapist: YouTube Live!